The southern canton of Switzerland manages to conquer everyone with its charm and intrigue thanks to its unique and original lifestyle. The main features of Ticino are its mild climate (with over 2,160 hours of sunshine a year), the Mediterranean flair thanks to the proximity of this region to Italy, the palm trees that characterize the long lake of Locarno, the particularly pleasant valleys, the artistic and architectural beauty of churches in typical Romanesque style and the picturesque streets that end in pretty and lively squares. However, the Alps and their majestic peaks are never far away, making this beautiful region a special place of enchanting beauty. 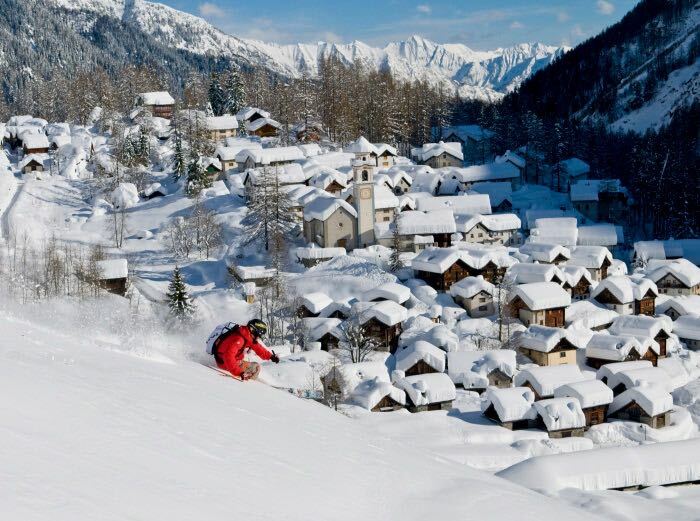 To use a slogan promoted by Ticino Tourism, the Canton of Ticino is a place that goes: "From palm trees to glaciers. Ticino is a land of contrasts. Beaches of sand and eternal snow, green hills and wild valleys are enclosed in a handful of kilometers. In practice, it is a very appropriate and concise description to symbolise the Ticino region, especially in winter. This can only happen in Ticino and those who live in the south of Switzerland have great freedom of choice in outdoor activities. Sportsmen can ski on the sunny snows that cover the mountains of Ticino, face exciting descents on skis or by sledge or make an intriguing cross-country skiing in the beautiful woods, among these suitable for families and children I recommend Campo Blenio, Carì and Cardada-Cimetta while for lovers of snowboarding and freeriding according to my experience the best slopes are in Bosco Gurin and Airolo. Among the sports to be practiced in the open air are magnificent mountain bike routes (I recommend Mount Tamaro where the world championships in this sport were held), over 4,000 km of hiking trails suitable for both beginners and experts, the intriguing challenges of paragliding practicable on Mount Lema or Rock Climbing (practicable at the climbing gym San Paolo in Bellinzona) to discover from an exciting point of view the intact nature in every season. In Ticino it is possible to have splendid holidays suitable for everyone, couples, singles, families or groups; to spend truly special days. Everyone will be at ease in a wonderful nature and will spend relaxing hours in southern Switzerland. The less sporty can relax during a pleasant boat cruise on Lake Maggiore and Lake Ceresio or walking through the windows of the elegant shops of Via Nassa in Lugano or the village of Ascona. It is also possible to visit interesting museums, among which, staying in the open air, I recommend an interesting visit to the Swissminiatur or walking in silence in centuries-old chestnut woods. Discover the masterpieces of art among which stand out churches that show a particular artistic value as the church of Sant'Ambrogio di Ponte Capriasca with the fresco of the Last Supper copy of the famous workof Leonardo da Vinci or the church of Santa Maria degli Angioli in Lugano with the fresco of passion and crucifixion, by the Italian artist Bernardino Luini (1480 about-1532). In the Ticino region it is possible to make truly unforgettable excursions, taking a marvelous look in front of breathtaking mountain scenery, admiring the magnificent castles of Bellinzona which are a UNESCO World Heritage Site. In Ticino the desire to know is unstoppable, given the countless attractions and extraordinary experiences that Southern Switzerland offers us all. Ticino allows you to appreciate the many culinary specialties of the place in a typical Ticino Grotto (for example the Grotto Ca' Rossa of Avegno in Valle Maggia), or buy the products at kilometer zero that you can find at the market of Bellinzona every Saturday morning. You can let yourself be won over by numerous traditional gastronomic varieties in an internationally renowned gourmet restaurant (I like the restaurant with the splendid view of Lake Lugano Artè) or in a lovely hiking restaurant in the mountains with a splendid view of the magnificent panorama (the restaurant inside the modern design hut of Monte Brè).